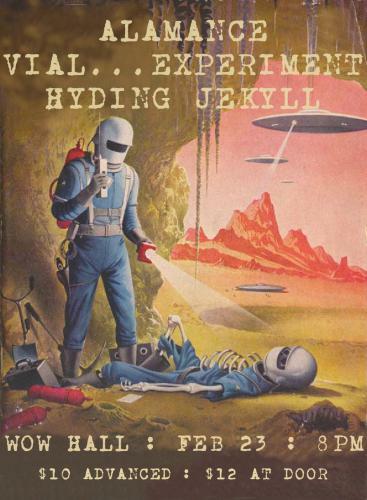 On Saturday, February 23, the Community Center for the Performing Arts and University of Oregon Campus Radio 88.1 FM KWVA proudly welcomes Hyding Jekyll back to the WOW Hall along with special guests Vial…experiment and Alamance. Creating the formula for a successful rock act in Eugene is a tricky proposition; a little too much of one ingredient, a bit not enough of another, and you could have a monster on your hands! For over 10 years Hyding Jekyll has been mixing musical ingredients in the Willamette Valley. A combination of the band's influences and its member’s experiences, the concoction moves from funk laden riffs to spacey openings. The songs tell a story from power to failure; humanity at it's best to worst. The music shapes the stories the band has been working on for the last 10 years. “We try to take everyone on an adventure,” notes chief chemist Greg Gillispie. Hyding Jekyll started in 2008 as a tribal funk trio. Over several lineup changes, Hyding Jekyll has become a much more diverse. The current lineup is Jeremy Stafford (drums, vox), Erek Andrus (guitar) as well as Nick Pierson (keys) with Greg Gillispie still on bass and lead vocals. After repeated shows at the WOW Hall and many other local venues, Hyding Jekyll took a bit of a hiatus to work on new music for the upcoming Final Chapter album. Hyding Jekyll will be playing many new songs that the fans haven't heard before as well as a few of the fan favs from over the years. Their eclectic nature allows Hyding Jekyll to groove to the sound of the moment and write the story around it. Hyding Jekyll continues to grow their local fan base while continuing as one of areas longest running most constant original bands. Always shifting changing and trying to give each show something different. The future is wide open and Hyding Jekyll looks forward to sharing it with you. Vial...experiment is a hard rock/metal band hailing from Eugene with a live show that brings both excitement and energy to any stage. The Experiment was begun in 2007 by Kevin Wayne "Kevlar" Richardson (guitar/vocals). His first attempts at creating chemical solutions were less than successful as band members prematurely precipitated. Finally though, he discovered the combination Mike Nelson on guitar with Tim Benton on drums – and the formula was a success! Alamance is a four-piece rock band from Eugene. With over ten years in the music industry, Alamance strives to blend rock elements from a variety of genres, styles and eras. The band’s most recent release, Collateral, set the contours for Alamance's sound and provided the foundation for its next installment -- expected late 2019. Tickets are $10 in advance, $12 at the door. Doors open at 8:00 pm and showtime is 8:30.